Appearing one year after II, Phantasy Star III was released in 1991 bearing the burden of expectations raised by I and II. However, varying appraisals began to be heard from the fans concerning the form the game's content took, which departed from the sci-fi-RPG world - which could also be called the Phantasy Star world - created by I and II. The choppiness of the enemy graphics, the medieval-seeming world and settei. And at the end of this game, which benefitted little from the grand story stretching across three generations and multiple endings it billed itself on, dissatisfaction among the fans was heard. Here, while going behind the scenes of III's development, let's try to search for the answer to why this game came to disappoint expectations. Why did Phantasy Star III go wrong? Compared to I and II, the multiple endings and, moreover, the story were on a rather large scale. But the development period was comparatively short, and the game was created by different staff members than those of I or II. 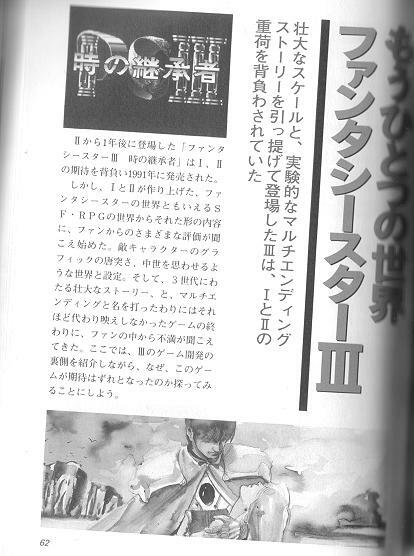 One lone member of II's staff, Hirondo Saiki, was in charge of the game design, but III was the first time the programmers and graphic designers had been assembled as a team. 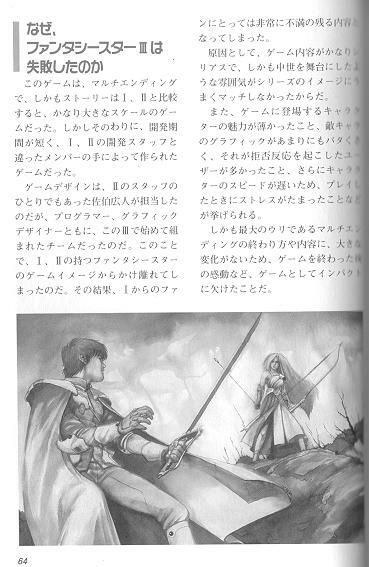 For this reason, the game differed from the Phantasy Star-game image I and II held. The effect was that the product ended up as an intense disappointment to fans from I. To cite a reason, the game's serious material and staged-in-the-Middle-Ages atmosphere didn't match the series's image well. The thin charm of the characters who appeared in the game, the enemy graphics that looked so Western, which provoked rejective reactions from a lot of fans, and the stress that piled up when playing the game from the slow speed of the characters could also be cited. What's more, the multiple endings, III's greatest selling point, didn't differ much in how they ended or their content, so III didn't leave the emotional impression a game does after it's over - it lacked impact as a game. Though it ultimately wound up as a product that left fans disappointed, at the time, the grand-scale settei Saiki-shi talked of in the interviews he gave during production were awesome material. That material presented a post-II world in which the Parmans, having become the gypsies of Algol, were living on board giant ships that were each comparable in size to an entire planet. Because he didn't want to show these settei till the very end, he talked of the medieval-ish settei that'd been made instead. He also said that he wanted to show things like how each ship held its own self-contained world and the battles of the fellow ships. But because the development period was so short, the entirety of this extremely charming world could not be realized as planned. In order to implement the big "multiple endings" scenario, expand the game's capacity, and fit everything in, the story was pared down. For that purpose, the world was scaled down. But the job was too much for the upstanding Saiki-shi to take on single-handedly; the project became rather trying in its second half, and that weariness came out in the game. The dedication and ardor he put toward the game's development could certainly felt from the figure of him walking through the offices, getting unsteady on his feet. 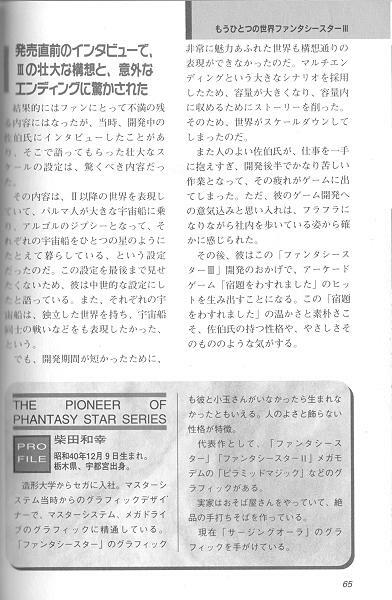 Afterwards, thanks to the development of Phantasy Star III, he came to create the arcade game hit I Forgot My Homework. The warmth and simplicity of I Forgot My Homework feels true to Saiki-shi's character and gentleness.